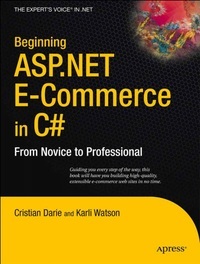 The book teaches the reader how to build a complete e-commerce web site written in ASP.NET 3.5 by taking them through the entire design and build process. Uniquely, this book shows how to handle payments through PayPal and DataCash; meaning that the reader is left with a fully functional e-commerce site at the end of the book. The previous edition sold 3,269 copies and still sells 80 a month two years after its release. Cristian Darie is a software engineer with experience in a wide range of modern technologies, and the author of numerous books, including his popular ASP.NET C# E-Commerce tutorial, his AJAX and PHP tutorial, and his SEO tutorial for PHP developers.